Ghosts of Belfast Celtic’s past were raised on July 18th 2009 with two major events marking the 60th anniversary of the club’s demise. 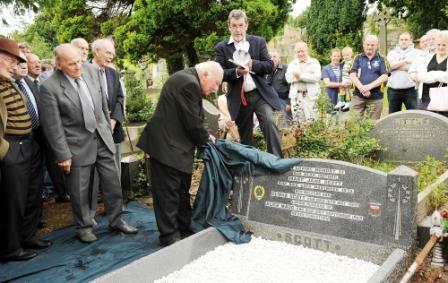 The last resting place of Elisha Scott, Celtic’s iconic manager, was refurbished by the Belfast Celtic Society and unveiled by his son Billy, on his 90 th birthday. A wealth of fans and famous figures turned out to pay their respects. 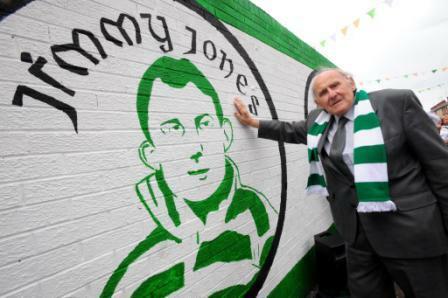 Afterwards, a new mural featuring legends Charlie Tully, Paddy Bonnar and Belfast Celtic Society President Jimmy Jones was unveiled. Belfast Celtic Society Chairperson Padraig Coyle was taken aback by the success of the events. He said; “These gatherings allowed us to touch the past and ensure the memory of Belfast’s Grand Old Team will live long across the generations. “Watching Elisha Scott’s son Billy unveil his father’s refurbished headstone was very poignant and we’re delighted he came with his family to share his 90 th birthday with Celtic fans. “I’d like to thank veteran journalist Malcolm Brodie and the Scott Family for making the day so memorable with their presence 50 years after the passing of the great Scott.“Similarly, thanks go to Patrick Adams, the monumental sculptor for his diligent work, actor Lalor Roddy and journalist Hugh Jordan for their readings." “The West Belfast Liverpool Supporters Club also participated, laying a wreath and thanks to the children from Whiterock area who, on chancing upon society members tending to the grave of Elisha Scott, mucked in and gave a hand clearing away rubbish and bracken. Finally, to the young people from St James’s, my heartfelt thanks and best wishes – the work of you and your mentors in creating the wonderful mural is a stunning example of positive community development and living history. You did yourselves, your families and the entire community proud! “The Belfast Celtic Society funded both events in their entirety and we hope the members of the Society feel their annual memberships are being put to good use. Other events are being planned for the near future so keep an eye on www.belfastceltic.org for more information.